I’ve been an industry analyst for over 20 years, which is hard to believe sometimes. I got started just as the dotcom craze was taking off, with new logistics startups coming to market every day (all of them announcing they were “The world’s leading provider of X” even though they were just a few months old). Virtually all of those startups disappeared by 2002 — they either burned through all of their investment money or were acquired by bigger fish. One of my first clients back in 1999 was Descartes Systems Group. The company wasn’t a pure startup at the time (it was founded in 1981), but like all software companies during those years, it rode the dotcom tidal wave up — and then crashed down with everyone else (see period from 1999 through 2002 in the stock chart below). Without going into all the details, it’s sufficient to say that Descartes (still a client today) came dangerously close to joining the others in the dotcom cemetery. Descartes survived, however, and became one of the first software companies to embrace the software-as-a-service (SaaS) business model. I remember speaking a few years ago with Art Mesher, Descartes’ CEO from November 2004 through November 2013, and he attributed the turnaround to Descartes’ shift from a “culture of selling” to a “culture of serving.” This was not a trivial transition because the software industry, until relatively recently, was long fixated on measuring its health and success by new license revenue (sales of products) instead of customer-centric metrics, such as realization of ROI and payback objectives. Where is Descartes today? The company is financially strong, with 14 years of record year-over-year growth. Descartes has 20,000+ customers on its Global Logistics Network, which experienced 21% growth and processed 18.6+ billion transactions last year. The company invests 17% of sales in research and development (R&D), which is a very healthy number. Descartes, in short, is alive and well. A couple of weeks ago, I attended the Descartes Evolution Global User & Partner Conference 2019. I’ve spoken at this event in the past, but this year I came mainly to learn and network with the attendees (over 600 this year, a new record). How can I summarize the many sessions and customer case studies I attended in a short blog post? I’ve been wrestling with that question since I returned. Instead of recapping every session and diving into too many details, I’ve decided to roll up my learnings and observations into a few key takeaways. There are a lot of niche supply chain and logistics solutions in the market and Descartes is good at finding and acquiring them. The big fish in the software industry get the lion’s share of attention from analysts, the press, and the market, but it’s clear that there are plenty of smaller fish who continue to thrive on the fringes of supply chain management, a little deeper and away from the sunlight — and that’s where Descartes likes to feed. One of Descartes’ most high-profile acquisitions was its purchase of MacroPoint for $107 million in August 2017. 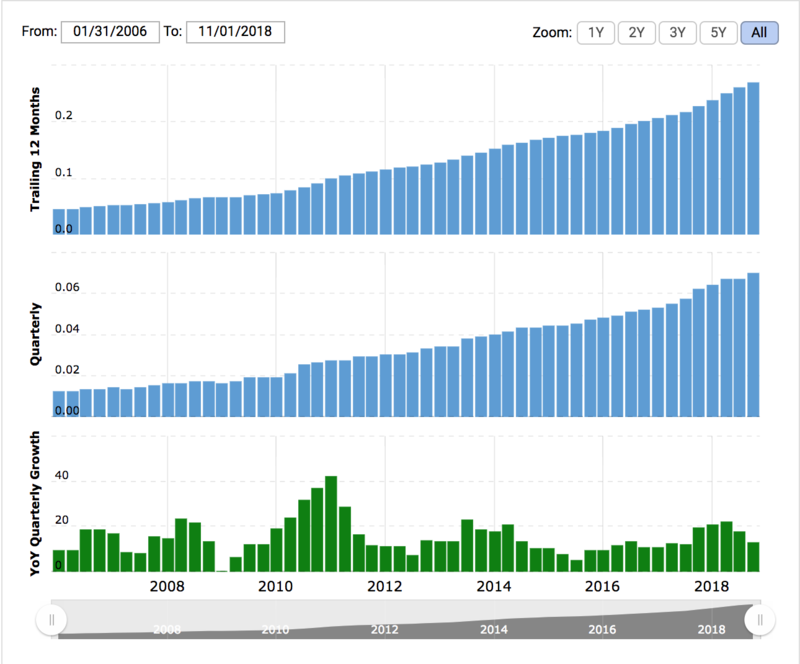 Over the past two years, there have been other similar acquisitions in the industry, along with multiple rounds of VC investments. Simply put, real-time freight visibility is hot right now, with both customers and investors. Why? Having to comply with more stringent customer delivery requirements is certainly one factor driving demand, with On-Time In-Full (OTIF) becoming a more critical metric. Another is that visibility enables companies to deliver an enhanced customer experience, which was the theme of this year’s conference. Keegan McCready, Sr. Project & Portfolio Manager at Steelcase, Inc. presented a great case study on the company’s journey and success with real-time freight visibility. The following video, which he shared with the audience, demonstrates how Steelcase is positioning its supply chain and logistics capabilities (including MacroPoint’s solution) as a competitive differentiator — with delivering an enhanced customer experience a central theme. Wes Burt, Production Control-SCM-Assistant Manager at Toyota Manufacturing Canada, also gave an informative case study presentation. In Toyota’s case, the customer is the company’s manufacturing plants, which run in a lean, just-in-time environment where every minute of downtime is very expensive. Toyota is using MacroPoint’s data to drive continuous improvement in route designs, manage “external crises” more effectively (e.g. winter storms), and work more collaboratively with carriers. These two presentations, along with the fact that all of the MacroPoint-related sessions were filled to capacity, further confirm that real-time freight visibility is becoming a “must have” capability for transportation managers who are looking to improve their operations and deliver an enhanced customer experience. “Content is where I expect much of the real money will be made on the Internet, just as it was in broadcasting,” wrote former Microsoft CEO Bill Gates back in January 1996 in an essay titled Content is King. Content is also king in global trade management, and where a lot of money can be made, which is why Descartes has invested heavily in this area the past few years via various acquisitions (e.g., Customs Info in 2014, MK Data Services in 2015 and Datamyne in 2016). Simply put, as global trade and ecommerce continue to grow, so will the importance and demand for global trade content. For related commentary, see Cross-Border E-Commerce: Growing Fast, But Still a Messy Reality and How Disruptive is Global E-Commerce? More Than You Think and Navigating the Ever-Changing Global Trade Landscape. Is there a bigger fish that might ultimately acquire Descartes? It’s a question I sometimes get from the press and investors. In this industry, I’ve learned that anything is possible. 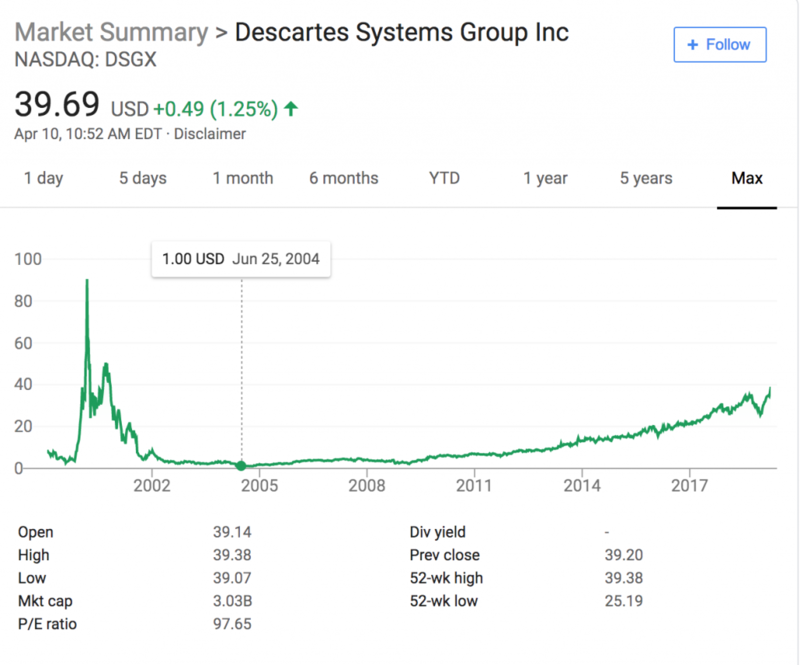 Five to ten years ago, no “traditional” software company would have been interested in Descartes because of its network-based, software-as-a-service business model. Today, everyone has embraced the cloud and subscription-based pricing, even Wall Street analysts who finally stopped caring about license fees. Descartes currently uses Azure services in certain business segments, such as its Descartes Datamyne™ Market Insight solutions [and] with Descartes MacroPoint™, one of the logistics industry’s largest real-time freight tracking platforms. Descartes plans on expanding the use of Azure services across its solutions by incorporating Azure AI, Azure Databricks, Azure SQL Server Managed Instance Database, and Microsoft Power BI to support machine learning, data processing and analysis, and data visualization. In addition, Visual Compliance, which Descartes recently acquired, already offers a denied party screening solution for Microsoft Dynamics 365. The bottom line is that relative to its peers in the enterprise software space, particularly those with ERP solutions, Microsoft lacks supply chain and logistics capabilities. These two fishes are already swimming together, so why not take the next step? Scott is Descartes’ President and Chief Operating Officer. He’s also been the emcee for the conference the past few years, offering funny commentary about Ed Ryan and U.S. vs. Canadian culture, sports, and politics (Scott is Canadian). Did I mention he likes to roast Ed Ryan every chance he gets? According to his bio, Scott worked in a private law practice in Southern Ontario, where he specialized in corporate and intellectual property law. Maybe he honed his comedic skills there, or maybe Ed Ryan just brings out the comedian in everyone — either way, Scott is a funny guy and I look forward to his comments about Ed at next year’s conference.